It was a very busy weekend for our family. Saturday, Lallie had her very first ever school program at Barnes & Noble. It was a program in conjunction with a book drive and it was just a wonderful morning. All the students came and sang songs and showed us the things they've been doing in school. Here, Lallie is ignoring the teacher's directions and sitting in the center of the circle, rather than holding on to the outside of the circle for a game of "Hi - Low." Lallie apparently loves the song "boo boo boo, boo boo" as she sang quite loudly and shook her little shakers as hard as she could. Her pigtails bounced like crazy! Here the friends are all marching in a Choo Choo Train line. Husband and I have been wondering where her latest obsession for choo-choo trains had come from. We also had the opportunity to meet Janeen Mason. She read her latest illustrated book (actually sang it), For Baby. It is a John Denver song which Ms. Mason illustrated. 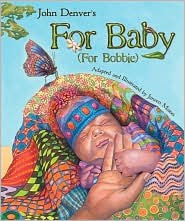 It is a wonderful book, full of color and meaning and stories. We had our book autographed. It was also wonderful to hear Ms. Mason talk to the friends about her visits to Africa and about the elephants (Lallie LOVES elephants). Later in the day, we headed off to a farm in Palm City for a birthday party. Here's Lallie and her friends playing on the tractor. It is an every weekend ritual (either Saturday or Sunday) that daddy makes pancakes for the family. We haven't missed a weekend yet! I know that some of my friends in-real-life have copied my Christmas wrapping station, so I thought I'd pass it along to my blogger friends as well! I made this a few years ago from a tip I read in Real Simple magazine (I think). It has worked wonders and keeps all my wrapping things together and organized, year after year. Another reason, I don't like those flat storage boxes as you have to dig for the paper you want, the ribbons get all tangled....ughh. Buy a 5 gallon bucket (mine's a Homer Bucket from Home Depot). Get a bucket garden apron (also found at Home Depot) and wha-la, instant wrapping station! Note all the Tinkerbell, Mickey Mouse and Princess paper for Lallie this year! The garden apron holds my scissors, tape, name tags, more tape, pens, cards etc. I like the folder part of the apron as it keeps my nametags flat and clean from year to year. To hold all my ribbon, I just take a wire dry cleaning hanger, wire cut the top, insert on the rolls of ribbon and then tape back together (you can see my ribbon at the top. This makes ribboning such a cinch, keeps them untangled and you don't have to worry about taping the ends (thus getting sticky ends and cutting them off, wasting ribbon). So, I hope this gives you some good ideas as to how to tackle your wrapping station. Also, since it stands upright, I have mine in the top of a closet so it doesn't take up much room! As my twitter followers know, I have a new car. And with my new car, I now have my satellite radio back (I am seiosly screaming for joy inside - I had it for years, and let it lapse and haven't had it in MONTHS! I really don't like current pop music or commercials, so this is very big for me. I also love talk radio including Fox News - which is why I'm politically ignorant right now, I haven't had it for months). But I digress. My favorite satellite channel by far is Martha Stewart Living. I have been known to call the Whole Foods show, Morning Living show (Kim & Betsy are my favorite, so funny), Everday Food, Dr. Oz, Living Today...well, all the shows, really. I usually get on too (my questions are just THAT good - kidding...it's really not that difficult, they always pick up on the first ring). 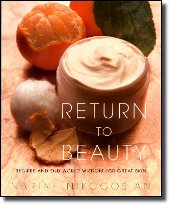 Anyways, on Whole Foods this morning, they were talking about a new book called Return to Beauty by Narine Nikogosian. 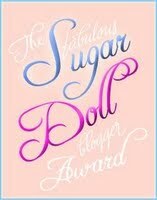 This book sounds fabulous. I will be getting everyone I know this book (after my personal review of course), for Christmas. Did you know mashed potatoes with olive oil (not butter) is absoutely the best thing you can do for your neck skin, to keep it from sagging? And, walking with a book on your head is not just for posture anymore. It keeps your skin taught and wrinkle free. I can see me now, walking around with potatoes on my neck with a book on my head. Husband will think I have lost it! What about milk (or yogurt), honey and flax for your face. At the age of 32, I have those dreaded between the eyebrow wrinkles. I tend to squint when I'm working and thinking which causes them. Okay, okay, I get them when I'm mad too. I want them gone. This book has natural, already in your home, recipes for reliving such skin issues without the cost and expense and without the chemicals. I am going to check it out and let you know if it's a keeper or not. So, I can't wait to see pictures and purchases and I really hope everyone has an absolutely fabulous time this weekend. From everyone back home, we want regular postings and tweets about what's going on as we're sitting on the edge of our seats waiting to hear every detail! :-) Safe travels too! Lallie got a new tee-ball set this weekend and it's all she has wanted to play with for a couple of days now. I have a few pictures, but I thought this video would be better, especially for the grandparents! Okay ladies! I want your honest opinion as we're looking for a new SLPS family vacuum cleaner. We're definitely going for the Dyson. But which one, the Dyson c25 Animal? or the Dyson c25 Ball? I need to know asap as ours is currently headed for trash-dump heaven!! Your opinions are always valued! Good morning y'all! Don't forget about my 100 followers giveaway! Click HERE to enter. The deadline is Tuesday at midnight! Hi y'all. Today is probably going to be my last during the day post for a couple weeks. I will still handle weekend updates and if I can swing in an evening post, I will. No worries - the Lilly giveaway is still on so enter away! Work has taken a big turn into extremely, extremely busy mode. Not only am I trying to complete budgets for 13 shopping centers, I have picked up management of two large centers in 2 months and was just appointed court receiver for another smaller center. Usually when they're court appointed, they're in severe need of help and therefore, my time. So, work has just gone from slow, to crazy busy (which is fine, because that means I'm still employed!) So, I am very thankful for my hiatus. Once things slow back down in the next couple of weeks, I'll be back! And, I promise to post tidbits here and there of really fun things that happen in our lives! Last night, the whole family waited in a long, long, long line to receive the first of Lallie's two H1N1 vaccinations. We were towards the end of the line and by time we got to the front, we were told they had seen over 800 children up to that point (6 months to 24 years old). We waited 2.5 hours. Husband brought Lallie a happy meal for dinner and when a restroom is not readily available and your potty-training child needs to go, they don't understand that it's okay to go in their diaper which was very upsetting for her (I put a diaper on her just for this purpose). When we got inside, she was thrilled to see a restroom. We got home quite late and Lallie had issues getting to sleep. She did NOT want to cooperate with me, no matter how soothing I tried to be. Husband was able to calm her down (she's kind-of in a daddy mode right now, she was in mommy-mode). We are not usually ones to freak out over things of this sort (well, sort of, I mean this is our child, so of course we're nervous, but you know what I mean). 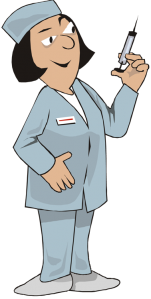 Many more people have become sick and/or died from regular flu than swine flu. However, we were told by the pediatrician that every child he's seen in his office who has had asthma and has contracted swine flu has ended up in the hospital, regardless of their stage (caught early or late). Lallie has asthma, so we're not taking any chances. There have been too many kids in our area that have swine flu. Thankfully, Lallie's school has a zero-tolerance policy for sickness right now. You will not walk into her school and see 1/2 sick kids without a fever with copious amounts of snout coming out of their nose or lots of coughing. They won't tolerate it right now. Therefore, even a cold has been scarce there. (knock on wood). The teachers are really wonderful during this whole flu season. We did talk with friends, family, researched the vaccine, talked with her pediatrician and the decision was just unanimous, she must get it. We worried a little bit about the mercury, but there is no more than what's in a can of tuna fish (per the dr.) and she's already had the MMR, and she's fine. In addition, considering Husband and I got ALL our vaccines with mercury as kids, the risks are quite low (and not yet proven yet?) Anyways, the benefits way outweigh the risks. So, now we wait for 28 days before she can get her next dose. Hopefully it will be in the drs. office by then and we won't have to stand in line. Until then, she is still very susceptible and we have to be careful. Lallie was an absolute trooper during the whole night. It was definately tough for her as well as on mommy and daddy. Husband and I barely spoke a word last night to each other after she went to bed - just relaxing and letting the day go. I love magazines. I read all the greats, Town & Country, Beautiful House, Coastal Living, Southern Living, Real Simple and there's one more. All You. I disoverd this magazine in Wal-Mart one day and picked it up. It is the best magazine for just a regular ole' working mommy-wife as it is down to earth and really actually pertains to me...and my budget. It's filled with grea t coupons, recipes, articles, shopping tips, make-up and fashion tips etc. Please stop and get one. It's only $2.74 and I know you'll love it. This month, they had a spread on gifts for the women, men, kids and pets in your life, whether they are co-workers (if you're a vet! ), for a yankee swap or for family and friends. They had some great, budget friendly ideas. Gloveables from Organize.com ($14.99 / pair). They have them in every color combination you could possibly imagine. How about a different p air for every day of the week! Or maybe a robe in Twinklzzz from Sleepyheads. 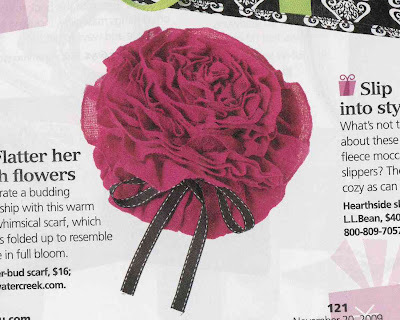 Or maybe a Flower-bud scarf from Cold Water Creek. (I had to scan and photoshop this picture because I wanted to show it all wrapped up like a flower bud. You could do this with any scarf! Moving on to the men. They didn't have that great of a spread of ideas, but I thought this was pretty cute and funny. 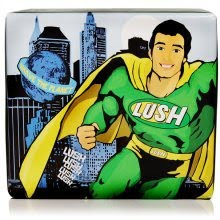 The Shave the Planet kit for men, complete with shaving cream, moisturizer, bar of soap and a massage bar, all from lushusa.com. For the teenager or "coming of age" girl, I thought these were pretty cute. Glam Girl Eyebrow Tweezers at $4.00 each are so cute! Of course, we must not forget the pets. I've always wanted a teesny, tiny dog that I will sit on my lap in the evenings, fit into a little hand bag and wear cute little outfits like this. 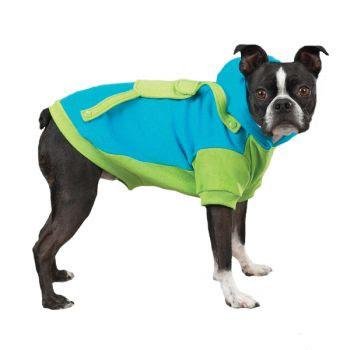 It's a little backpack hoodie from Oh My Dog Supplies. 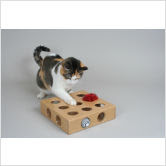 The little cat puzzle box is from csnstores.com (which I love CSN stores).